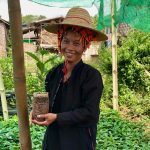 Wai Ti, of Pin Mi Kone village, shows us her young coffee plant in her bamboo shade house. While her coffee bean harvest may be a few years away, this dedicated entrepreneur is excited to take a chance on an experimental cash crop to increase her family’s annual income. Wai Ti is 32 years young. She has been married for 11 years and has 3 children under the age of 13. She did not go to school as a child due to her extreme fear of people. She always thought it was too late for her to get an education. Little did she realize that one of the key components of the Shanta/Muditar Coffee Program is education. Education in the care for, harvest, and marketing of the coffee beans; giving her a second chance at vocational learning. 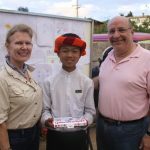 Wai Ti is receiving a new skill set that currently increases her confidence and one day soon, her family’s bottom line. 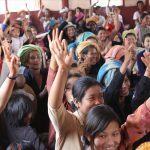 The Shanta/Muditar Coffee Farm Program gives Wai Ti hope. 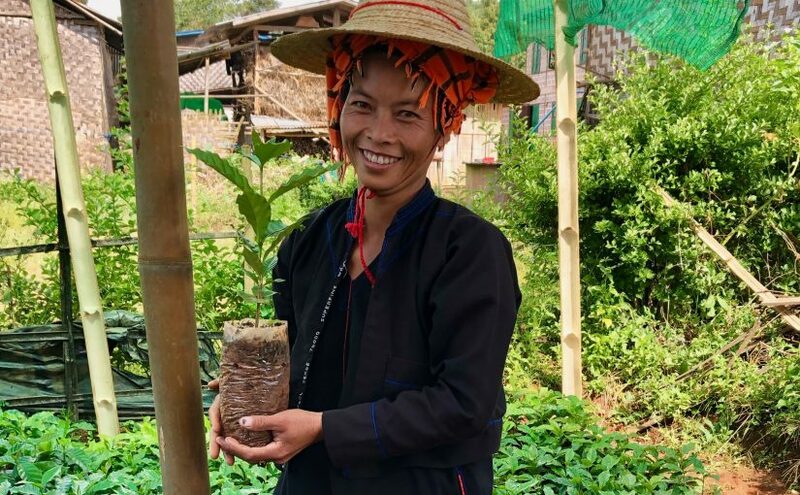 Wai Ti knows that when she takes it to market, it will reap the reward of being more valuable per pound than the garlic, cabbage, tomato, and ginger she currently grows. When asked what she will do in a few years with the additional income when selling this future crop, she says with a smile, “…Education. For my children”. Coffee is part of ongoing Income Generation Program and has established over 500 family coffee farms. Stay tuned for future updates on this exciting Shanta/Muditar Program. Donor Feature: Why Advisory Board members, Arthur Cohen and Elizabeth Karcher, invest in Shanta . . .